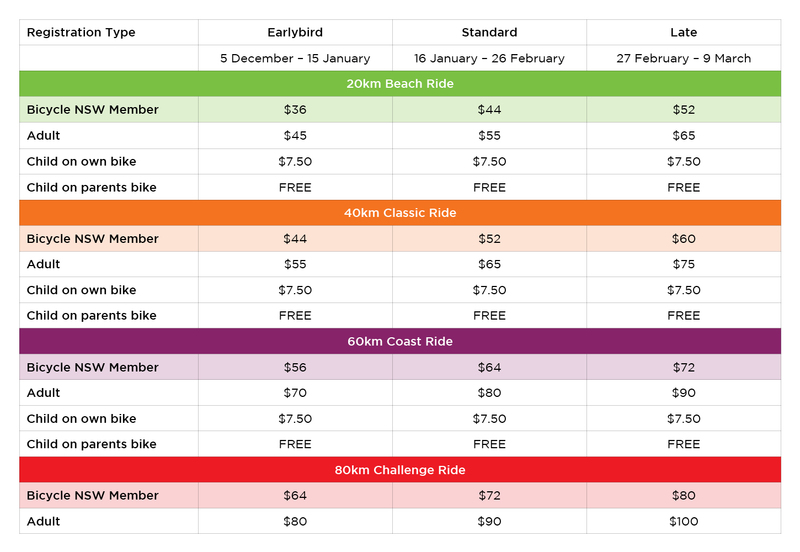 Free Rider Pack postage - Free postage is available to all participants who register on or before 11:59pm on Monday February 11. Rider Packs will be sent to the postal address entered upon registration, therefore please ensure the correct details are entered. Mailout of Rider Packs will commence on Monday February 18, 2019, via Australia Post. It can take up to 5 working days for your Rider Pack to arrive. Rider Pack pick up - For those who registered on or after Tuesday February 12, your Rider Pack will be available for collection at Ride HQ at the start site on the day of the ride (please bring a copy of your confirmation email with your Bib Number on it when collecting your Rider Pack). All online registrations close 5pm on Saturday March 9, 2019. If for some reason your Rider Pack does not arrive by post, we can arrange a new one at the prepaid registration tent at the start site on the day of the ride. If you have lost or damaged your Rider Pack, you will be issued a replacement on the day, at Ride HQ for a replacement fee of $20. For participants picking their Rider Packs on the day of the ride, please bring a copy of your confirmation email (with your Bib Number on it) and we will have your Rider Pack waiting for you. We recommend getting to the start site at least 30min prior to your start time. For times and locations of each ride, click here. Children under the age of 8 are not allowed to ride independently in the Heart Foundation Gear Up Girl. If the rider is aged 16 years or younger on the day of the ride they must be accompanied by a Parent/Guardian, as nominated at the time of registration. Please click here for specific information on the ride of your choice.